Colosseo’s production department has been experiencing a very busy period since the spring and while others were enjoying hot summer weather and holidays, our staff was working hard day and night to fulfil the requirements of all the projects that have accumulated in recent months. Our production site spans 600 m2 and includes two electrical component assembly lines, two mechanical assembly lines, one test and aging line, a warehouse and the final product packing line. 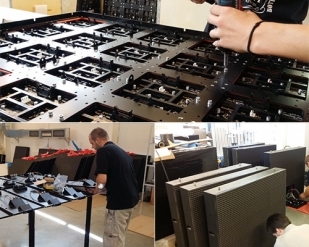 From the manufacturing of the cable harnesses to the manufacturing of complete LED cabinets for screens, perimeters or ribbon boards, our well trained staff is always committed to performing at the highest standards. Thanks to them we have completed big projects like City Arena in Trnava and center hung scoreboard for the Swiss team Servette Geneve HC, etc. We must also thank our support team, who travelled extensively and trained game show operators on how to manage Colosseo’s new control system. Colosseo would like to say “thank you” to every member of our team and show appreciation for the positive attitude towards the hard work during these extremely busy times within the company. 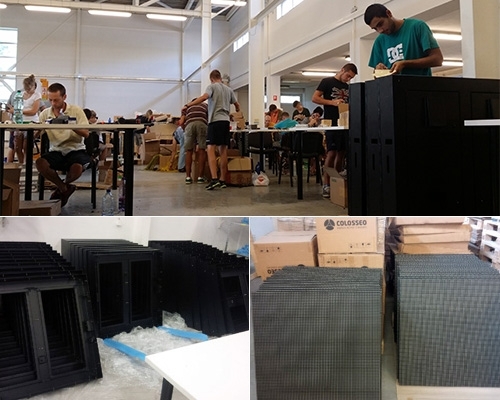 Jan Fedor, Colosseo’s Head Production Manager said: “We have been extremely busy recently and have worked many double shifts, but when I saw the end results of our labour, I immediately felt great satisfaction”.